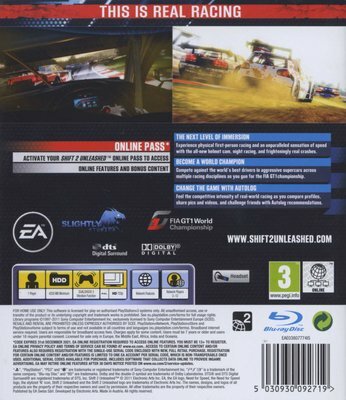 The critically acclaimed Shift franchise returns to the track to deliver the most physical racing experience to date. Feel what the Driver's Battle is actually like in an unparalleled racing experience that captures the physicality and brutality of being behind the wheel going 200mph. Frighteningly authentic physics and degradation of tracks and cars, thrilling night racing, and an eye-watering sense of speed combined with the helmet camera puts you right in the heart in the action. Feel every scrape, bump, and burn out in an all-out fight to the finish line. 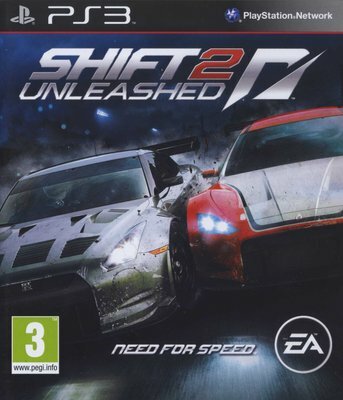 Shift 2: Unleashed sets the bar for realistic racing and gives all the excitement and exhilaration of race day in a groundbreaking authentic experience. Next Level of Immersion - Experience visceral first-person racing like never before. The all-new helmet cam recreates realistic driver head movements that deliver an unparalleled sensation of speed: lean and tilt into the apex of corners, feel the impact of every scrape, bump, and crash, experience true in-cockpit vibrations, and more. True Realistic Racing - Shift 2: Unleashed redefines the racing simulator genre by bringing the atmosphere of race day to life. From authentic car and crash physics to terrifying night racing to the battle-scarred look and feel of both cars and tracks, Shift 2: Unleashed leaves no detail behind in delivering the most authentic racing game experience yet. Featuring the FIA GT1 World Championship and GT3 European Championship plus real-world drivers, tracks, and cars, this is truly tomorrow's sim for today’s adrenaline-fueled racer. Amazing Career Depth and Variety - Earn unlocks and participate in multiple racing disciplines on the way to becoming the FIA GT1 World Champion. Featuring everything from new Endurance races to muscle and retro cars, Shift 2: Unleashed gives you the flexibility to choose the path that fits your individual racing style. Fight for position, dominate opponents, and annihilate track times every time out—the battle doesn't end at the finish line, it extends throughout your entire racing career. The Autolog Social Network - Connects friends, share stats, video and images both while you are playing and via your web browser. Customize for Show or Customize to Win - Unleash your creativity to turn some of the world's most elite high-performance vehicles into fire-breathing weapons. Customize the engine, the body, the suspension, and much, much more, then put your ultimate racing machine to the test in any mode. Whether your goal is to race a 1000-horsepower Econobox or a tricked-out GTR, you have nearly limitless options to reign supreme on the track where every second counts. Multiplayer Race Support - Enjoy 12-player race support online.